Southern California native Alexandra Norwood found herself out of the Phoenix summer heat and in the cool climes of Iceland studying Vikings and 15th-century sod houses the summer after her freshman year at ASU. A casual conversation with a fellow student in Barrett, The Honors College about her interest in archaeology led Norwood to visit with Margaret Nelson, a vice dean in Barrett and President’s Professor in the School of Human Evolution and Social Change (SHESC). A subsequent casual conversation with Nelson resulted in the first of three National Science Foundation-funded summer projects that Norwood would participate in during her time at ASU. The first was to work on the research project in Iceland. The next two projects were NSF Research Experiences for Undergraduates — a summer field school in New Mexico studying a Native American pueblo excavation and the Summer Undergraduate Research Fellow in Oceanography Program in Rhode Island working on ocean core sediments from the South Atlantic and Indian oceans. For her last research trip over spring break, Norwood traveled to South Africa to work on SHESC Director and President’s Professor Kaye Reed’s project at the University of Cape Town cataloguing animal fossils from a place called Geelwal Karoo. The link between these projects for Norwood is what her research passion has become — how we shape our environments and how our environments shape us. “My first year at ASU, I started working with Professor Mike Smith in the Mesoamerican Archaeology lab at SHESC and became part of a long-term, large NSF-funded project — ‘Service access in premodern cities’ — which looks at historical and archaeological cities and how different people had access to services across cultures and history,” Norwood said. This research gave her a first publishing credit and provided a “home” for her four years at ASU. “I’ve spent more time in the Meso lab than in any apartment that I have had during the last four years. I’ve even had pizza delivered there late at night,” Norwood said with a laugh. This summer, Norwood will stand in the plaza of the pre-Columbian city of Teotihuacan, one focus of the Meso lab research, for the first time — the subject of her honor’s thesis with adviser Smith on formal open space and governance in premodern cities. Another casual visit to the planetarium at ASU’s Marston Exploration Theater connected her to the School of Earth and Space Exploration’s Geological Sciences, and she added a second major to understand the complex methodologies and geological context of archaeological sites. 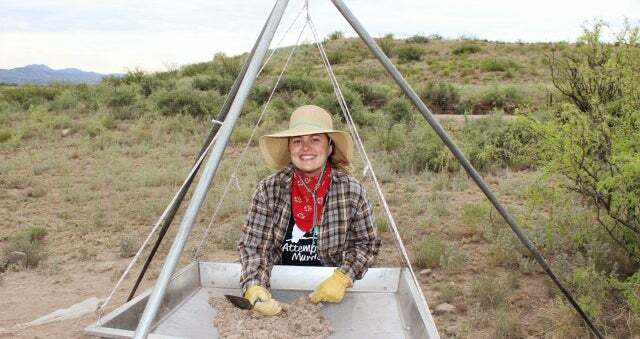 Along the way, Norwood was president of the Undergraduate Anthropology Association for two years and presented at the internationally attended Society for American Archaeology meeting and the ASU SHESC Undergraduate Research Symposium, as well as the ASU Institute of Human Origins’ science workshop. She has also found time to volunteer at the Arizona Natural History Museum, Pueblo Grande Museum and Barrett Page Turners, reading with elementary school students at the Tempe Public Library, and of course, maintained a 4.0 GPA. She worked as a student assistant at the Institute of Human Origins (IHO) during her junior and senior years and was the primary web editor for IHO’s AskAnAnthropologist.asu.edu website. In addition to being a National Hispanic Scholar recipient, Norwood received the ASU Origins Project Undergraduate Research Project Award, Donald Johanson Research Award and SHESC Cynthia Laken Award during her time at ASU. Norwood is also a double CLAS Dean’s Medal awardee from SHESC and SESE for 2017 and received a coveted NSF Graduate Research Fellowship, which provides full funding for three years at any university in the U.S. to pursue her graduate degree. Answer: I took SHESC Foundation Professor Curtis Marean’s class in hunter-gathers. In the first lecture, he talked about his theory for the great human diaspora. He spoke about the first humans who went to Australia, 50,000 years ago, standing on the southern edge of the Asian continent and looking out to sea. He said that those humans were like us in their mental capacity and in their capacity to engineer and imagine, as we do. They could not see any more land but had to imagine that there was land out there and take the initiative of building a boat and going out to find it. They were explorers of the unknown like we still are today. Inspirational! I then took his class in zooarchaeology, which sparked my interest in understanding the environment, and the rest is history! A: I took a socio-cultural anthropology class — Humans and the Environment — with SHESC Assistant Professor Shauna Burnsilver, who is an ethnographer. I had taken a lot of intensive science classes about the human-environment relationship. But this class was about human resilience, the way that humans perceive their environment, and environmental challenges and human adaptability to them. It was a good convergence of two ways of understanding these relationships — giving me a more holistic perspective by combining both the science and the messy way that people live in their environment. A: ASU’s anthropology program and the Institute of Human Origins have the most excellent reputations. A: Talk to everyone because every unique opportunity that I have had has arisen from a casual conversation, and most of the meaningful relationships that I have formed here at ASU began from casual conversations. A: I will be attending the University of Michigan in their doctoral program in biological anthropology, which means doing paleoecological research to understand the environmental context of human evolution, with plans to do fieldwork in Kenya. A: I would fund science and research on combating climate change.